Get the ultimate in protection and versatility without the bulk for your iPad® with a military-grade case that’s made to withstand shock, water, drops, and other hazards. 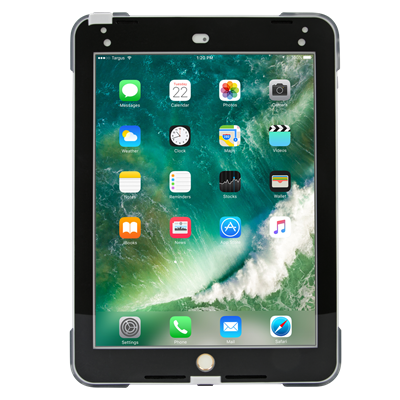 Whether it’s while traveling, in the office, or at a remote job site, Targus SafePort® Rugged Case keeps your 10.5" iPad Air and 10.5'' iPad Pro® protected. From its hardened polycarbonate shell with shock-absorbing materials to the advanced corner and side protection, it meets the rigorous MIL-STD-810G standards that protect from harsh environmental conditions, sudden drops, and accidental slips. And that’s all in a thinner, lighter design. An integrated stand for landscape viewing and typing positions adds versatility and hassle-free portability. The stand seamlessly slides open with just one hand and sits firmly on nearly any surface thanks to its hinge-less design. Connect the soft neoprene hand strap and your iPad® becomes more accessible and secure than before.